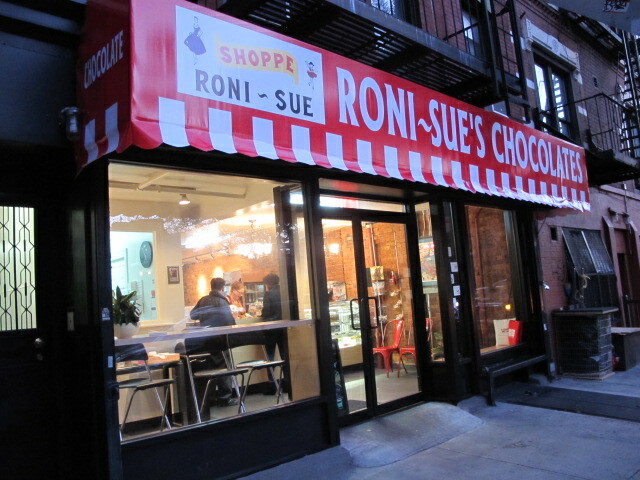 Just a few weeks ago, beloved Lower East Side chocolatier Roni-Sue's (148 Forsyth Street, 212-677-1216) ventured beyond its Essex Street Market stomping grounds and into a stand-alone retail location on Forsyth Street. In addition to soon-to-launch classes, the sibling space is offering coffee, hot chocolate, morning pastries, and, of course, its now-notorious (in the neighborhood, at least) chocolates. In this interview, owner Rhonda Kave discusses the new space, basement-brewed absinthe, and why bacon is still having its moment. Our Pig Candy (chocolate-covered bacon), bar none. We started making it in 2008, and I thought it was going to be around for a New York Minute. I thought people would try it, they'd like it, and that'd be the end of it. We featured it in that year's Chocolate Show, and it got written up in the New York Times -- then everyone wanted it, and it built and built. There has been this kind of craze over bacon and desserts over the past few years, and we were kind of at the forefront of that serendipitously. You're a fan of some pretty offbeat flavor combinations. Anything you've done recently? Every year for the Lower East Side Pickle Day, I actually make a pickle truffle. I started doing them because I wanted to make a weird splash in the neighborhood, and I thought, "why not a pickle truffle?" 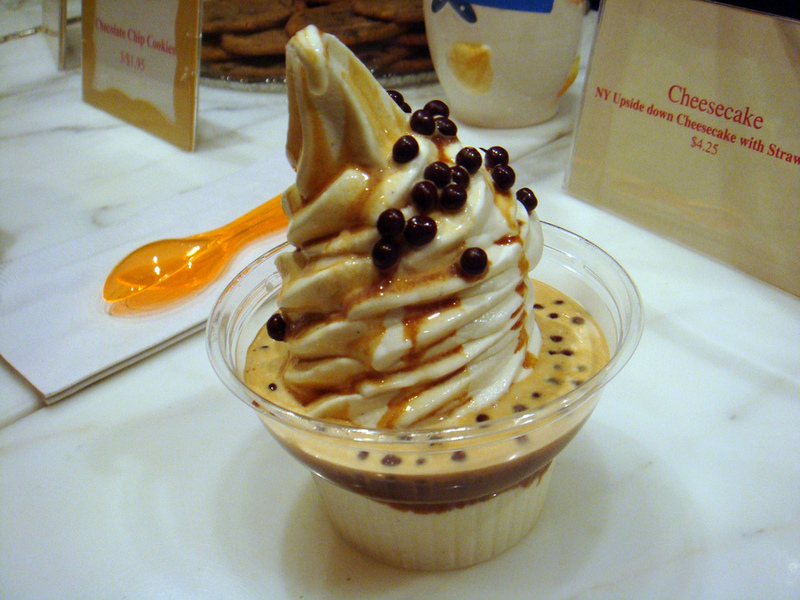 And it was really surprisingly good -- it's kind of refreshing. It was fun to challenge myself in that way. That's one of the things I like to do -- to see if I can bend something quirky into my will and make it tasty. How do you choose which base to use for your truffles? We have a white chocolate ganache, which I'll use for some of the cocktail truffles -- such as the Margarita or the Lebowski -- where you want the alcohol and the other flavors to be really front and center. [White chocolate] is pretty neutral, so when you add the lime and tequila (for the margarita), that's what you taste. Many of your truffles take a 'behind the bar' approach -- any particular reason? I used to be a bartender back in the day. The Cocktail Collection was actually the very first collection I made when I started Roni-Sue's. I was in the middle of creating it and was trying to determine the sixth and final chocolate for the line. My son, who's a chef, came by and brought a little bottle of absinthe from the restaurant he was working at. This was before absinthe was legal -- they were brewing it in the basement. I said to myself, "That's what I'm going go make: an absinthe truffle!" So I did. How do you manage to create so much flavor in such tiny bites? One of the other bases I make is called persipan, which is a little bit unusual; not too many people are making it. It's similar in consistency and flavor to marzipan, but it's made predominantly with apricot kernel instead of almond, making the resulting base lighter and fruitier. When I want the underlying ingredient to be the thing you taste the most, I'll use this. In fact, two of my seasonal truffles right now use it: the pumpkin spice and the caramel apple. How do you think up these flavor profiles? What is your process? Right now I have a couple of folders of ideas that haven't seen the light of day yet. They're waiting for their turn -- their close-up. I get inspired by different ingredients that I might see. I love going to a place like Kalustyan's; it's a playground for me. I can't get out of there without spending a minimum of $100. I just went there the other day, and I bought watermelon powder. I don't know what I'm going to do with it yet, but if I see watermelon powder, I've got to have it -- I might need that! Whenever I see something that's really quirky and piques my interest, I usually get it and then think about what I'm going to do with it later. I also like to haunt old liquor stores -- the dusty shelf on the bottom, especially -- to see what might be there. My given name is Rhonda Sue, and when I was a kid, I was called Roni-Sue. When I was born, my mom owned a women's clothing store; it was kind of unusual in that day and age for a woman to own her own business. She decided that when she had a little girl, she would incorporate girls' clothing into the shop, so she named the shop Roni-Sue, after me. When I was thinking about a name for the chocolate shop, I came across the original sign from her store, which I now have in my apartment. One day I just looked up, and the answer was there. It's an homage to my mom. On the topic of family, your daughter Allison also has quite the sweet -- and boozy -- tooth. Yes! Allison owns First Prize Pies, which has taken off like a rocket. Her and another baker Keavy [Landreth] of Kumquat Cupcakery have joined forces, and they'll soon be opening Butter & Scotch, a craft cocktail and dessert bar in Brooklyn. What do you like to snack on at the shop? 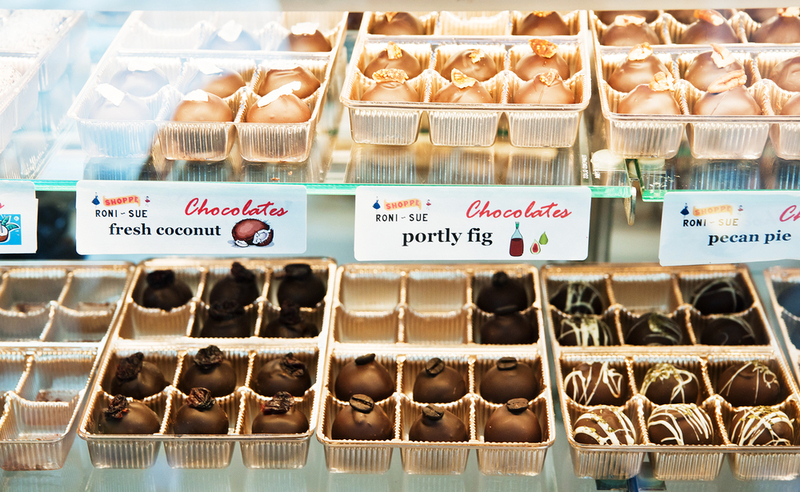 One of my personal favorites is the fresh coconut truffle, because I'm a coconut freak. When my sister lived in Florida, I'd beg her to send me the coconut patties. I revere those! They're probably terrible now if I actually tasted them, but that taste memory is there. What do you hope guests take away from the Roni-Sue's chocolate experience? It's very important to me that our chocolates have a bold and recognizable flavor profile. Nothing upsets me more than when I buy a really nice box of chocolates, spend 20 minutes choosing the flavors, and then get home and can't tell the difference without a scorecard. I want to be able to tell if it's pomegranate or pumpkin, you know? 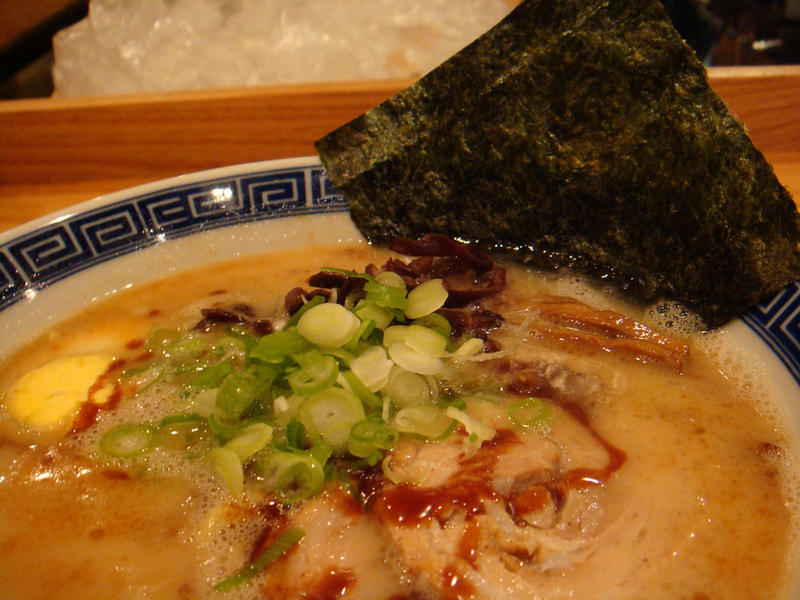 Also, I really like to create a complex, layered flavor profile. For example, if I'm going to make a raspberry truffle, it's not going to have raspberry flavoring. All of the flavor is going to come from whole fruit and fruit elements. So I'll take dried raspberries and plump them up with some Chambord, I'll add some raspberry jam, maybe a little bit of raspberry vinegar -- there are a lot of elements that layer up to create that flavor. We also use our direct trade chocolate from MOHO Chocolate Company in Belize, which is really delicious. How did you decide to use chocolate from Belize? Besides the fact that it's delicious, I feel good about it. It's certainly important to me -- and I think is becoming more important to customers -- to know where their products come from. A lot of commercial chocolate is sourced from the Ivory Coast, and that has a pretty nasty tradition of child slavery and trafficking of children to work in the cacao fields. I'm a partner in MOHO Chocolate Company, too -- December will be our second year in business together. Speaking of anniversaries, this retail opening marks six years since Roni-Sue's opened its original doors at Essex Street Market. How did you choose the market as your original space? Part of my senior project at NYU was about markets, and it brought me down to the Essex Street Market. It's just the kind of place that I like to find when I travel. I like to see where the people shop and what they like to buy and how they cook it. I thought it was the best-kept secret in New York. I still love being at the market. I love the camaraderie, being around the other merchants. People would always ask us how we produced everything in our tiny spot there, and we'd just say, "You live in New York, you learn to work small." "Chocolatiers are good people and one of the chocolatiers I have profiled in this column previously is proving my point! Roni-Sue always has delicious candies worth sampling. What with her cocktail collection of truffles, her pig candy (chocolate covered bacon) and her signature buttercrunch to name a few, how are we supposed to decide what to buy? With Valentine's Day approaching, Roni Sue has added two edible roses to her line-up of extraordinary chocolates. Appearing only for Valentine's Day and Mother's Day each year, Roni's Roses are not only delicious, they are helping in the fight against domestic violence. Before opening her chocolate shop, Roni Sue worked for many years with the Coalition Against Domestic Violence. Today Roni Sue donates a portion of the proceeds from the sales of Roni's Roses to the agency where she used to work to help them provide phone cards to victims. Providing victims with phone cards provides them with a safe way to make phone calls to access essential services from the hotline. It is hardly a sacrifice for chocolate lovers to try out these roses! Roni's Red Rose has a Callebaut bittersweet chocolate ganache center blended with rose petal jam, powdered fresh dried rose petals and rose liqueur. The center is hand-rolled and dipped in dark chocolate then topped with a fresh-dried rose petal. Her White Rose is a Callebaut dark chocolate rose bon bon with a white chocolate ganache center blended with rose petal jam, rose petal powder and rose liqueur. Either choice is a winner and both choices help turn victims of domestic violence into winners. For those of you in the New York City area, Roni-Sue will be doing a tasting for the Chocolate and I - New York event in Manhattan on Monday, February 8th from 7:30 to 9:00pm. She will also be doing a demo and sampling in Soho at the Dean & DeLuca store on Thursday, February 11th from 3 to 6 pm. If you are not in the New York area, the roses are available for order from her website. Trust me, you do not want to miss these roses! See, I told you chocolatiers are good people - and not just because they make our treats!" "The Essex Street Market at Delancey Street is an indoor market where you can buy everything from fresh produce to gourmet products (closed Sundays). "Mayor LaGuardia created the market in 1939 to get the pushcarts off the street," said Jeffrey Ruhalter, a fifth-generation butcher who says he is the market’s last original tenant. "It was New York City’s first supermarket." More recent market tenants include Saxelby Cheesemongers, which specializes in regional cheeses, and Roni-Sue’s Chocolates. Owner Rhonda Kave made chocolates as a hobby for years before opening the shop a year ago. Specialties include a cocktail collection of chocolates named for mojitos, mimosas and Manhattans; chocolate-covered bacon; and tea-and-honey lollipops." "Tuesday night I was at City Harvest's Bid Against Hunger event, fawning over Eric Kleinman's (Bar Milano) housemade rabbit terrine and the foie torchon with duck prosciutto from Hudson Valley Foie Gras. 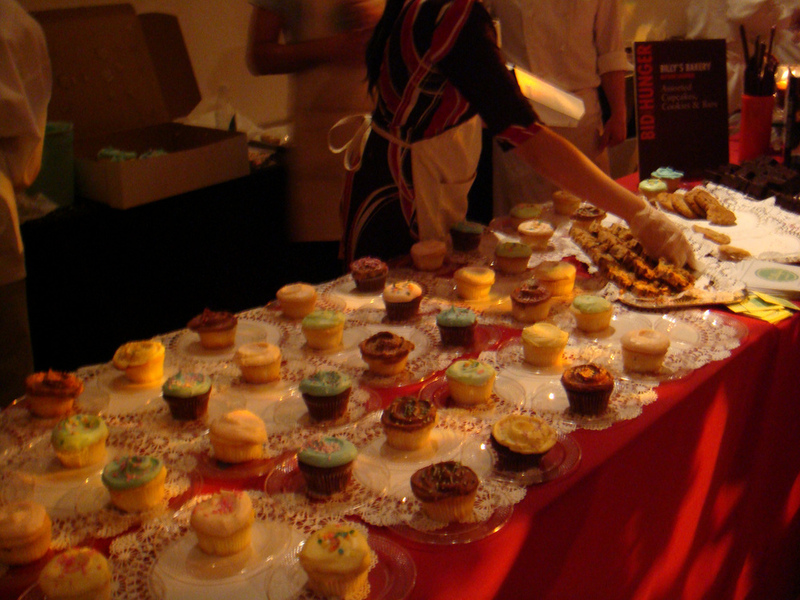 A good majority of the desserts at the events were repeats from the SWEET festival a few weeks ago. Much to my delight, Francois Payard brought back his hot and cold pina colada (which I covered in more detail for Serious Eats' SWEET festival write up). Ron Ben-Israel was present with the same two cakes from SWEET, the chocolate stout cake with malt buttercream and a lemon cake with Grand Marnier, cranberry buttercream, and lime zest. Following suit, The Modern did a repeat with the Coconut Chocolate Demeux. Il Laboratorio del Gelato had little gelato bites flavours of dark chocolate and peanut butter flicker in my memory. Billy's Bakery arrived with plenty of cupcakes on hand, and so was Roni-Sue with truffles, honey-tea lollipops, and that crazy, crazy delicious buttercrunch of hers." To read the rest of Kathy's blog post, click here!